September 11, 2001. Just Like Any Other Day for these Working Dog Heroes. There have been many heroic stories of search dogs working what became known as Ground Zero after the tragedy of 9/11. But we also remember two separate stories about the guide dogs who brought their humans to safety as the day’s events were unfolding. 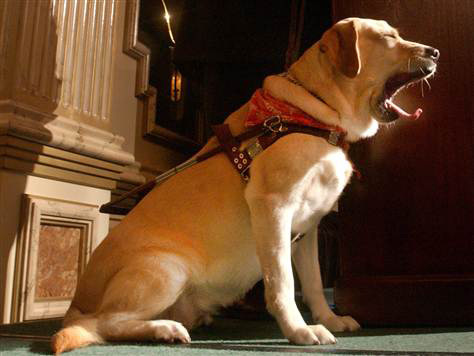 Guide Dog Roselle at the American Hero Dog Awards ceremony in 2002. Photo by Spencer Platt. Roselle, a yellow Labrador Retriever, and Michael Hingson first met on November 22, 1999 at Guide Dogs for the Blind. She was his fifth guide dog. “It was obvious from our very first walk together that we were a perfect match,” said Michael. The teamwork they developed was put to the ultimate test on September 11, 2001. As a computer sales manager, Michael was working at his desk on the 78th floor of the World Trade Center’s north tower when American Airlines Flight 11 crashed into the other side of the building, 18 floors above. Roselle guided Michael down 1,463 steps out of the building. Just as they emerged from the building, the south tower collapsed. “While everyone ran in panic, Roselle remained totally focused on her job,” said Hingson. While debris fell around them, even hitting them, Roselle remained calm. She found a subway station and led them both underground to safety. As usual, Dorado, a yellow Labrador Retriever was lying under the desk of his charge, Omar Eduardo Rivera when the first plane hit the North Tower of the World Trade Center. Rivera’s office was on the 71st floor and he heard, felt and smelled what was happening. He also felt the unbearable heat. As he and Dorado moved toward the exit, Rivera thought about the number of stairs ahead of them and felt he would never make it. “Not having any sight I knew I wouldn’t be able to run down the stairs and through all the obstacles like other people. I was resigned to dying and decided to free Dorado to give him a chance of escape. It wasn’t fair that we should both die in that hell,” said Rivera. He unclipped Dorado’s lead, ruffled the dog’s head, gave him a nudge and ordered him to go. Rivera felt himself alone for several minutes, but then felt a familiar fuzzy nudge beside him. “He returned to my side a few minutes later and guided me down 70 flights, out into the street,” said Rivera. They did get separated by the panicked crowd for a few minutes in the stairwell. But within moments, the dog found his way back to Rivera and again nudged his leg. As the two were making their way down the stairs, a co-worker caught up with them. Rivera held her arm with his right hand and with Dorado guiding him on his left, the dog helped them get down the stairs and onto the street. It took them more than an hour to get down the stairs and reach a safe distance before the tower collapsed. We will never forget that day and all those who were a part of it, some who are here and some who have departed, and we must never, ever take our wonderful dog friends for granted as they are the other side of our heart. Previous Previous post: Service Dog In Training and Handler Detained by Southwest Airlines. Next Next post: The Store-Bought Puppy.